Emami A & Monge M. MRI-Inspired High-Resolution Localization for Biomedical Applications: Artificial Nuclear Spins on a Chip. IEEE Solid-State Circuits Magazine 10, 34-42 (2018). Monge M, Lee-Gosselin A, Shapiro MG & Emami A. Localization of microscale devices in vivo using addressable transmitters operated as magnetic spins. 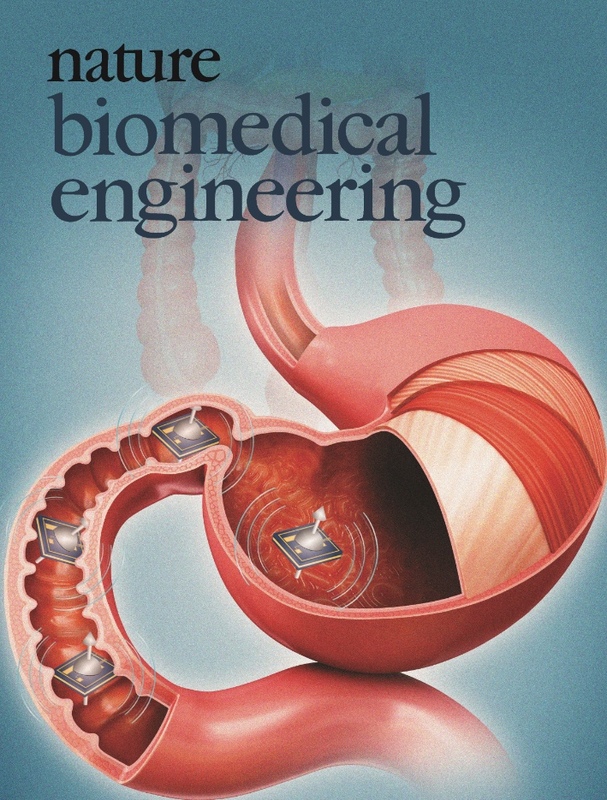 Nature Biomedical Engineering 1, 736-744 (2017). Monge M, Lee-Gosselin A, Shapiro MG & Emami A. Localization of microscale devices in vivo using addressable transmitters operated as magnetic spins. Biomedical Engineering Society Annual Meeting (BMES) (2017). Agarwal A, Gural A, Monge M, Adalian D, Chen S, Scherer A & Emami A. A 4μW, ADPLL-based implantable amperometric biosensor in 65nm CMOS in 2017 Symposium on VLSI Circuits. Raj M, Monge M & Emami A. A Modelling and Nonlinear Equalization Technique for a 20 Gb/s 0.77 pJ/b VCSEL Transmitter in 32 nm SOI CMOS. IEEE Journal of Solid-State Circuits 51, 1734-1743 (2016). Raj M, Monge M & Emami A. A 20Gb/s 0.77pJ/b VCSEL transmitter with nonlinear equalization in 32nm SOI CMOS in 2015 IEEE Custom Integrated Circuits Conference (CICC). Cerida S, Raygada E, Silva C & Monge M. A low-noise fully differential recycling folded cascode neural amplifier in 2015 IEEE 6th Latin American Symposium on Circuits & Systems (LASCAS). Yue L, Monge M, Ozgur MH, Murphy K, Louie S, Miller CA, Emami A & Humayun MS. Simulation and measurement of transcranial near infrared light penetration in SPIE BiOS. (SPIE). Monge M & Emami A. Design considerations for high-density fully intraocular epiretinal prostheses (Invited Paper) in 2014 IEEE Biomedical Circuits and Systems Conference (BioCAS) Proceedings. Monge M, Raj M, Nazari MH, Chang H, Zhao Y, Weiland JD, Humayun MS, Tai Y & Emami A. A Fully Intraocular High-Density Self-Calibrating Epiretinal Prosthesis. (ISSCC Special Issue) IEEE Transactions on Biomedical Circuits and Systems 7, 747-760 (2013). Monge M, Raj M, Honarvar-Nazari M, Chang H, Zhao Y, Weiland J, Humayun M, Tai Y & Emami-Neyestanak A. A fully intraocular 0.0169mm2/pixel 512-channel self-calibrating epiretinal prosthesis in 65nm CMOS in 2013 IEEE International Solid-State Circuits Conference Digest of Technical Papers. Chang JH, Liu Y, Kang D, Monge M, Zhao Y, Yu C, Emami-Neyestanak A, Weiland J, Humayun M & Tai Y. Packaging study for a 512-channel intraocular epiretinal implant in 2013 IEEE 26th International Conference on Micro Electro Mechanical Systems (MEMS). Yoo J, Becker S, Loh M, Monge M, Candès E & Emami-Neyestanak A. A 100MHz–2GHz 12.5x sub-Nyquist rate receiver in 90nm CMOS in 2012 IEEE Radio Frequency Integrated Circuits Symposium. Yoo J, Becker S, Monge M, Loh M, Candès E & Emami-Neyestanak A. Design and implementation of a fully integrated compressed-sensing signal acquisition system in 2012 IEEE International Conference on Acoustics, Speech and Signal Processing (ICASSP). Calienes W, Monge M, Silva C & Reis R. Physical synthesis of an n-bits pipelined Division Module in XVI Workshop Iberchip. Monge M, Raffo M & Silva C. Design of an architecture for a Multilayer Perceptron Neural Network on FPGA in XIV Workshop Iberchip.